We would like to invite you to ‘The Laundry chorus’, a performance of the instructions in my local launderette. Throughout the Spinning Stories project Emily and I have been interested in the language of instruction that accompanies laundry work, ranging from very straightforward practical guidance to advice for maintaining moral standards. 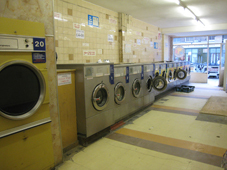 The contemporary launderette, with its overload of instructional and rule-based signage, provides us with a space to explore the babble and nonsense that ensues when these are made audible (all at once).